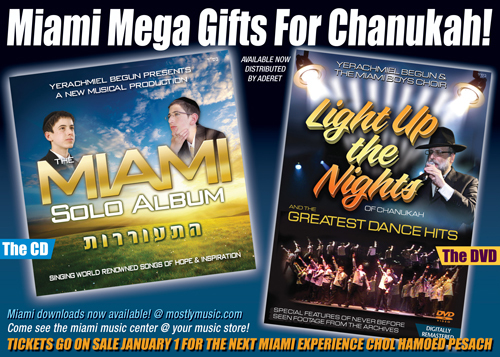 2 NEW MIAMI MEGA GIFTS FOR CHANUKAH! For the first time ever, Yerachmiel Begun & MIAMI have released 2 separate products at the same time! Both products make a unique & fantastic gift for Chanukah; that the entire family can enjoy. Over 5 years in the making, this album is a first of its kind. 10 classic world-renowned songs of Hissorirus sung only by MIAMI SOLOISTS. Accompanied by the adult choir of Israel, the songs picked are specifically not MIAMI songs. A really refreshing twist to hear these multi – talented boys sing, with a MIAMI style interpretation, the biggest classic favorites of our time and yesteryear. All with totally new arrangements by 5 different arrangers. This beautiful album will uplift and inspire us. Featuring the never before seen lead song of the most famous Chanukah album of all time, ‘LIGHT UP THE NIGHTS’ – this MIAMI songs & dance collection is non-stop fun and excitement. Including 11 of the best selection from MIAMI’S 10 DVD’S. All digitally remastered for the highest quality audio and video. The contrast between the years is awesome, and it amounts to a real journey through time. We are reminded why MIAMI is, as Nachum Segal says onstage in the opening number, the number 1 act in Jewish music. Also included are 4 fantastic special features of never before seen footage from the ‘vault’. MIAMI singing with the biggest stars in Jewish music, & The MIAMI BAND, & more. THE CD & THE DVD. A real treat for the Jewish music world, and what a perfect Chanukah present they make! Also check out the MIAMI MUSIC CENTER in most major cd- dvd stores. Also announced: Tickets for the MIAMI EXPERIENCE 3, coming Chol Hamoed Pesach to Brooklyn college will be available starting January 1 from jewishtickets.com. The greatest shows are being planned.